Stamps Happen – My Cardz ~ My Passion . . . Happy Friday!! Just a quickie today … I’ve spent most of the day organizing my supplies. I’ve been losing tooo many things and decided it was time! Found lots of things I forgot I even had! So that’s a good thing. 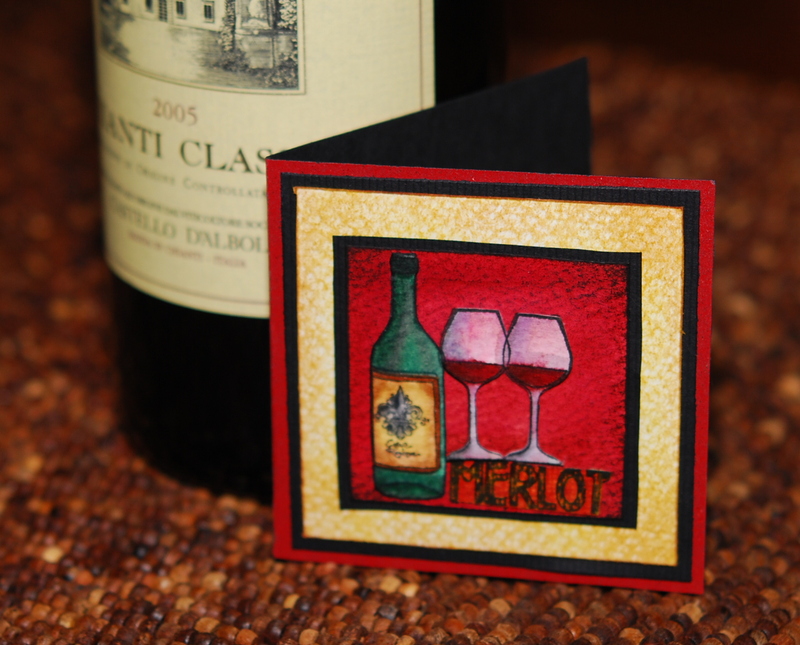 This card is made using a stamp by one of my VERY favorite artists – Tara Reed. 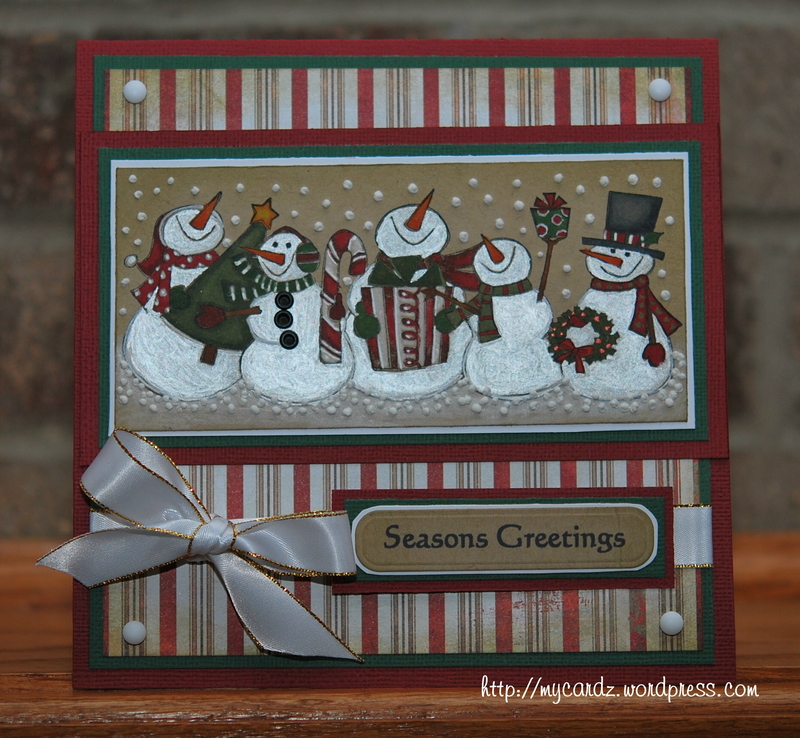 She does some amazing work AND, she’s super nice – she even takes time to comment on cards made using her stamps! How cool is that?! 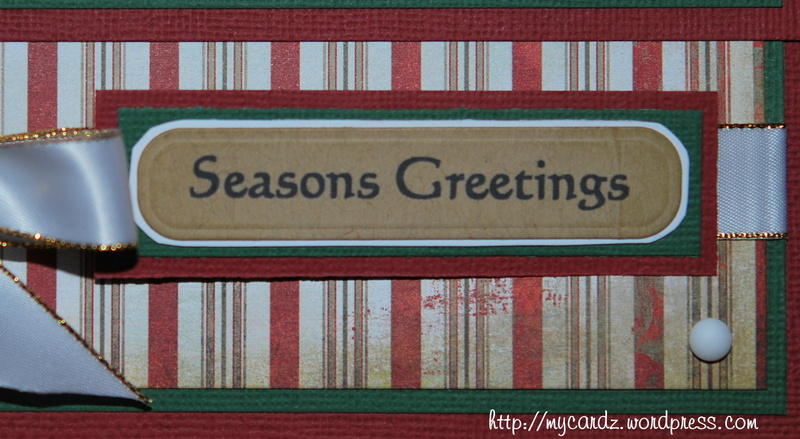 I love the simplicity of this stamp and the fact that it is large enough to be the central image for a Christmas card. 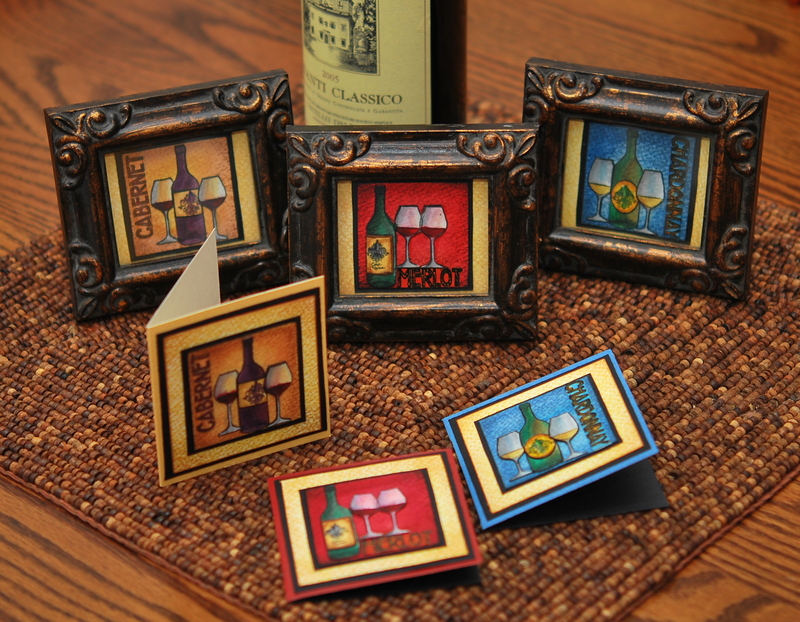 I’m always looking for ideas for quick and easy cards that can still be personalized for a handmade touch. 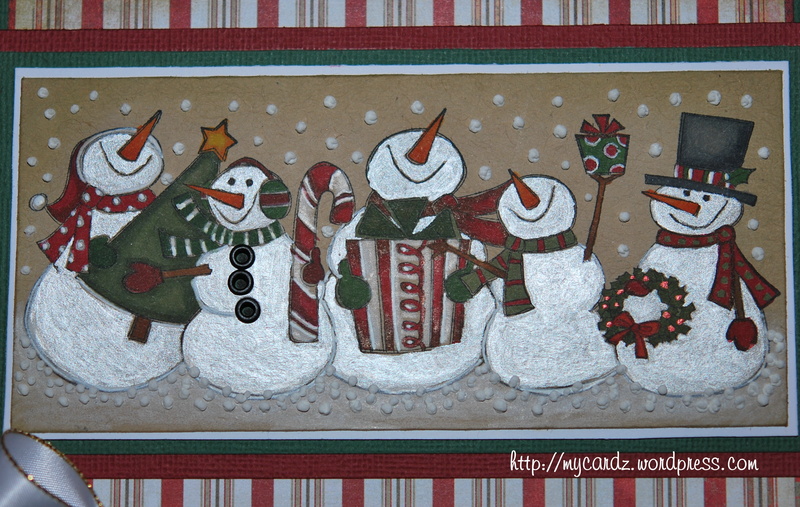 This Stamps Happen art stamp, Joy of the Season, is available at Janlynn Memory Stamps. I also thought the stamp went perfectly with this VERY cool paper from Creative Imaginations. The fabric brads are from Spare-Parts, and the ribbon is actually white ribbon that has been colored with Copics! Thanks for visiting today – TGIF!! Yay! Copics Creations Challenge No. 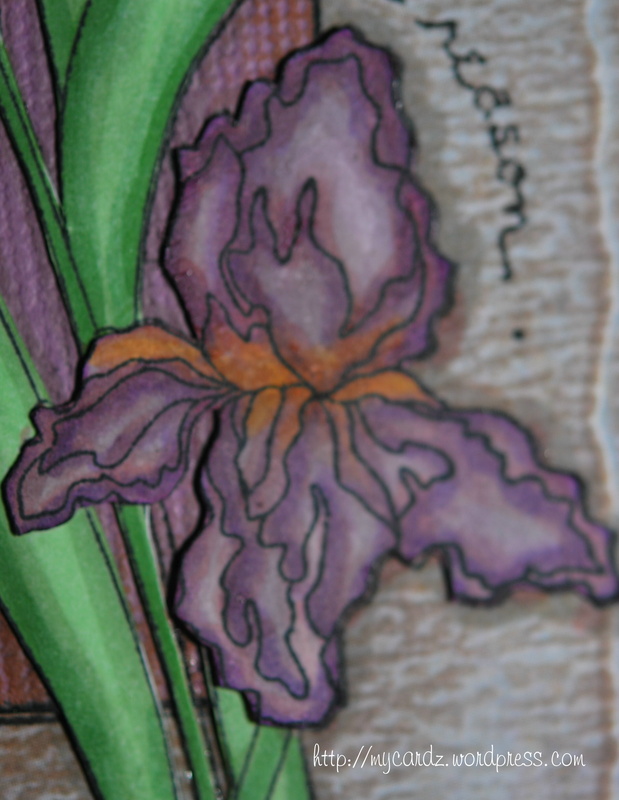 12 ~ Using Colored Pencils and OMS with your Copic Markers. 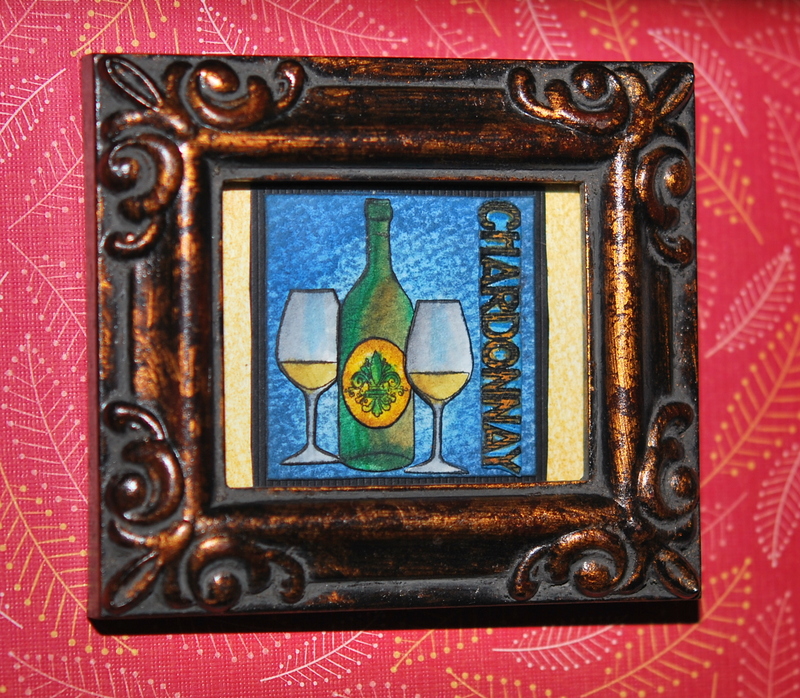 Our challenge is being sponsored by one of my very favorite art stamp companies, Janlynn Corporation. Each DT member received a beautifully illustrated Stamps Happen Flower Fairy stamp from Janlynn Corp. for this challenge. 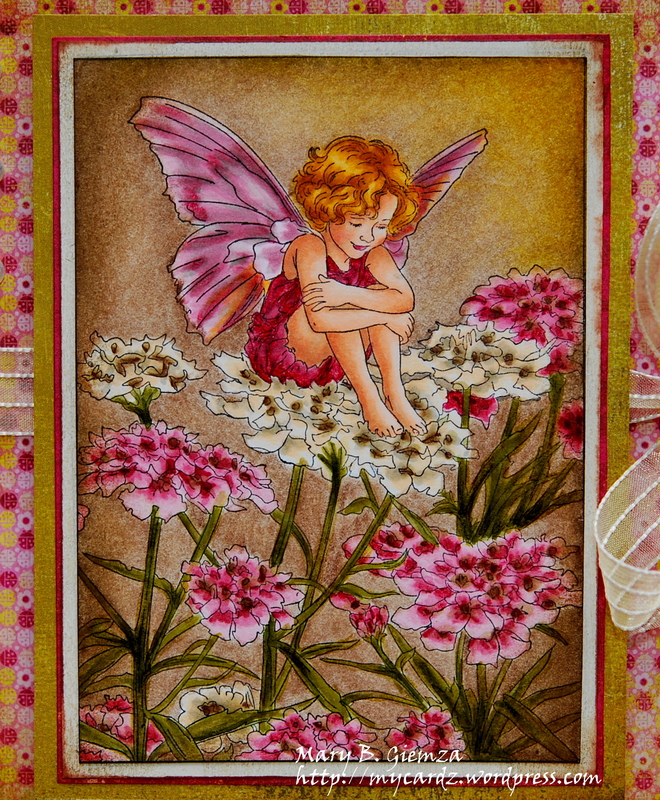 My stamp is called Candytuft Flower Fairy, found here. I really think I NEED to start collecting these stamps, I just LOVE them! Each of the FF stamps are the product of English illustrator Cicely Mary Barker, you can read more about her here. 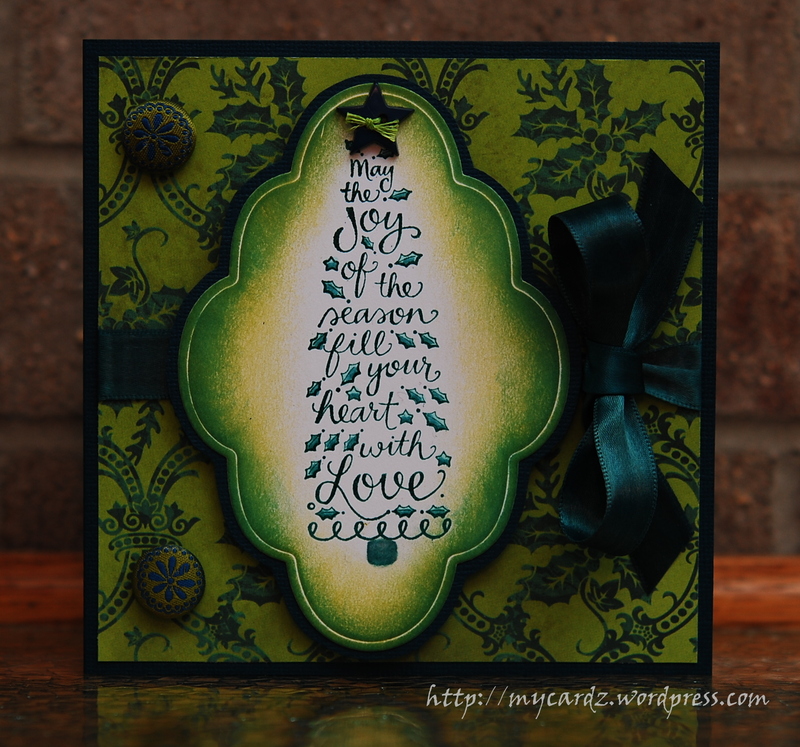 The DP used for my card is from the Basic Grey lemonade collection. Along with my usual Copic Markers, I used two Prismacolor pencils ~ Dark Brown for the flower centers and the background and Spanish Orange for sunlight in the upper right corner. 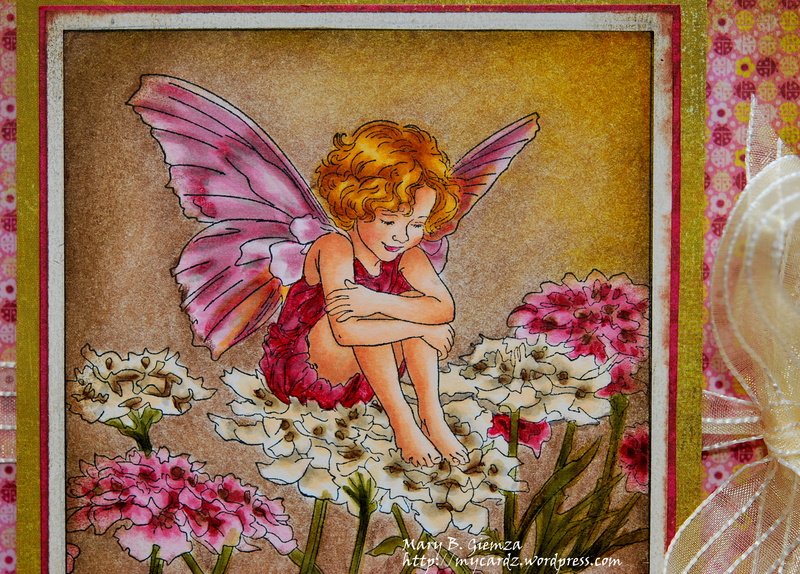 You MUST check out all the other Flower Fairy cards on the Copic Creations blog ~ It’s really cool to see all the fairies in a row, colored, of course, soooooo well by the entire CCDT! You also MUST join us for this challenge! Another awesome prize is being offered by our sponsor, Janlynn Corporation. All the details can be found here. Thanks for stopping in today! It’s a short week for me, we’re off tomorrow to Minneapolis so I can FINALLY become officially CERTIFIEDin Copics by the one and only Marianne Walker herself! YAY! 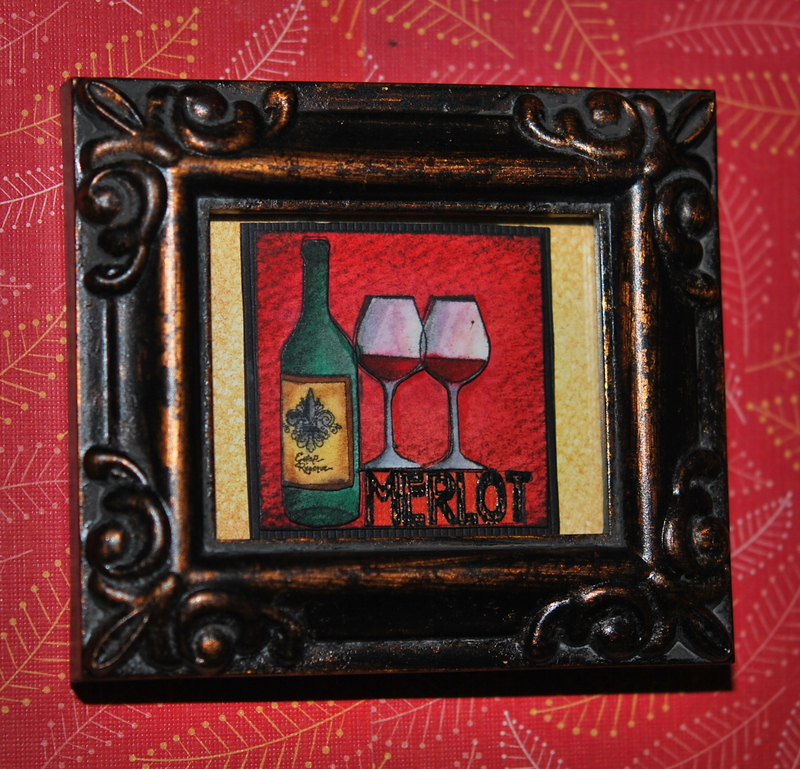 And, this sooo fun craft stamp is by one of my all-favorite artists, Tara Reed, of Tara Reed Designs. (Tara actually takes the time to comment on cardz that I’ve done using her stamps!! How cool is that??!!) 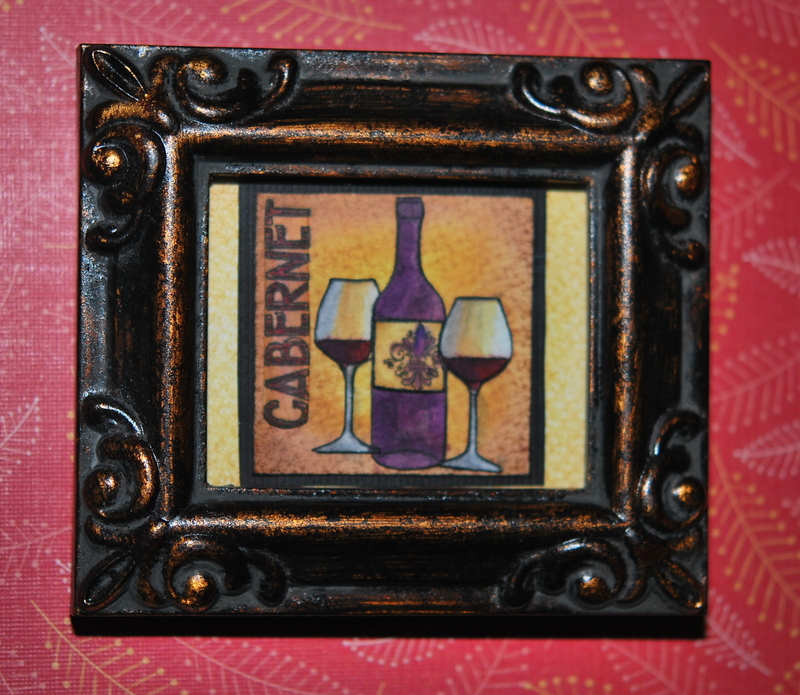 This craft stamp is distributed by Stamps Happen, Janlynn. Thank you for your visit today~ Hope you’re having a great weekend! 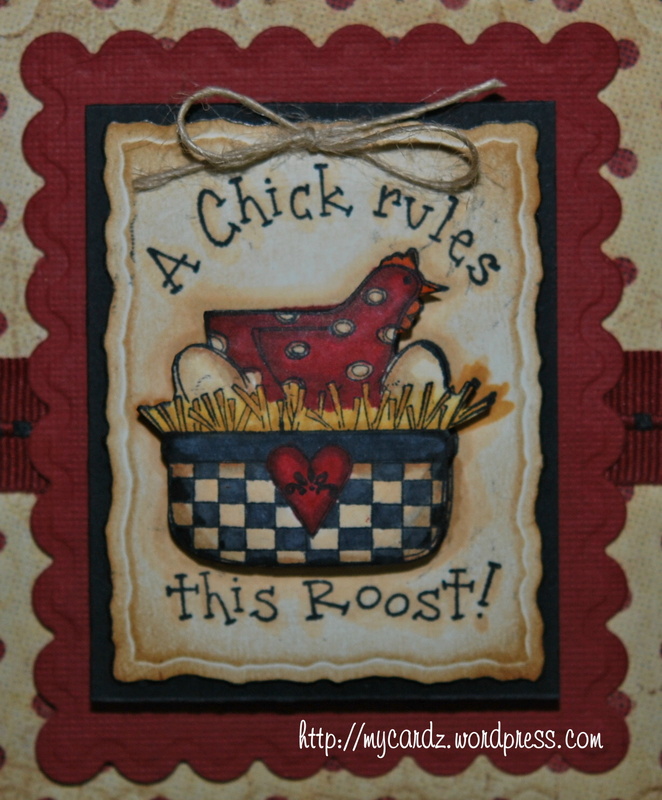 I just LOVE this craft stamp from Stamps Happen by the amazing artist Tara Reed! It’s so perfect for a few of my friends whose husbands are either deployed or in transit and not home at the present time. Sometimes, it helps to add some humor to a very difficult situation. How perfect is this craft stamp?!! (her husband is due back to the USA in September!!) Yay! Janlynn is having a SUPER sale….please check out the details here. 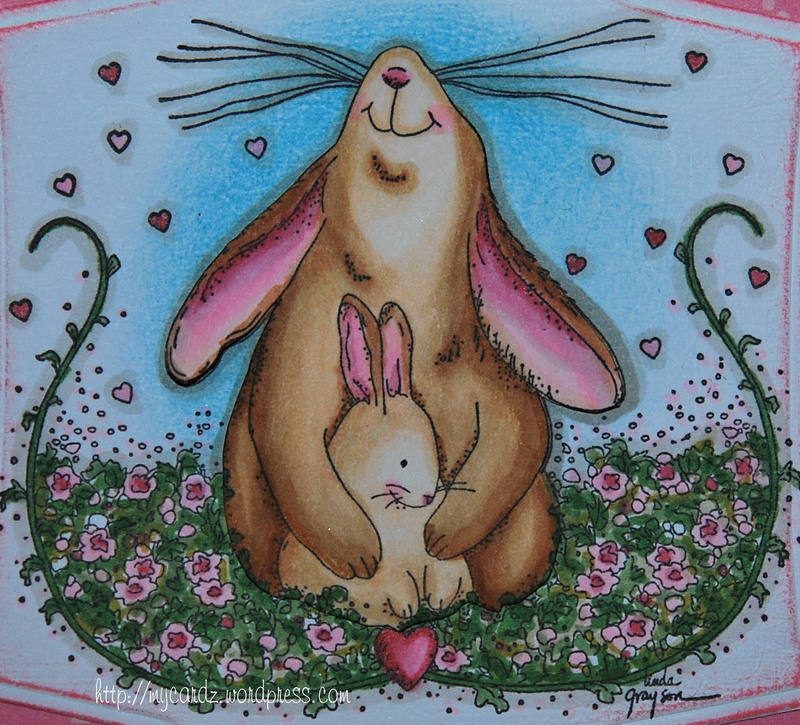 The stamp used for this card is by Stamps Happen from Janlynn. I LOVE these stamps! You really need to take a peek at their amazing selection of stamps! 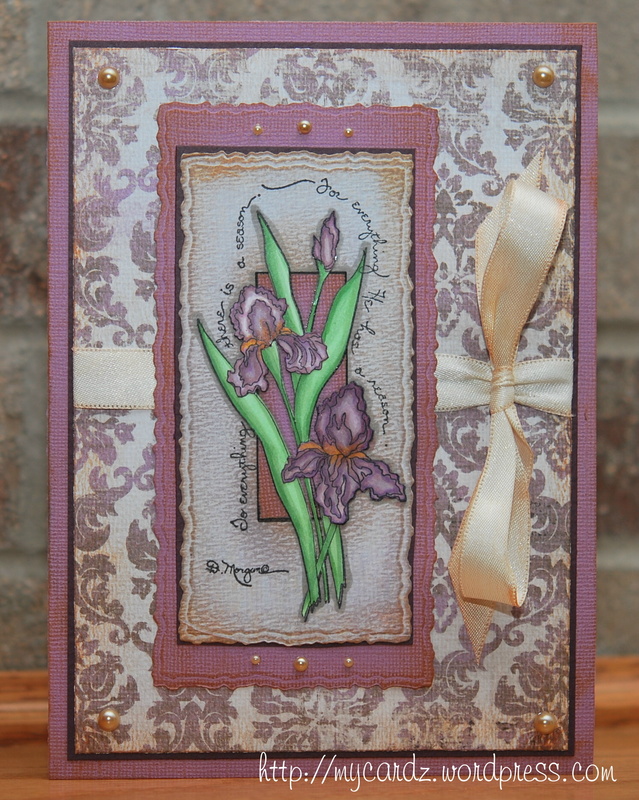 I thought this Iris stamp would be a perfect image for Mother’s Day! 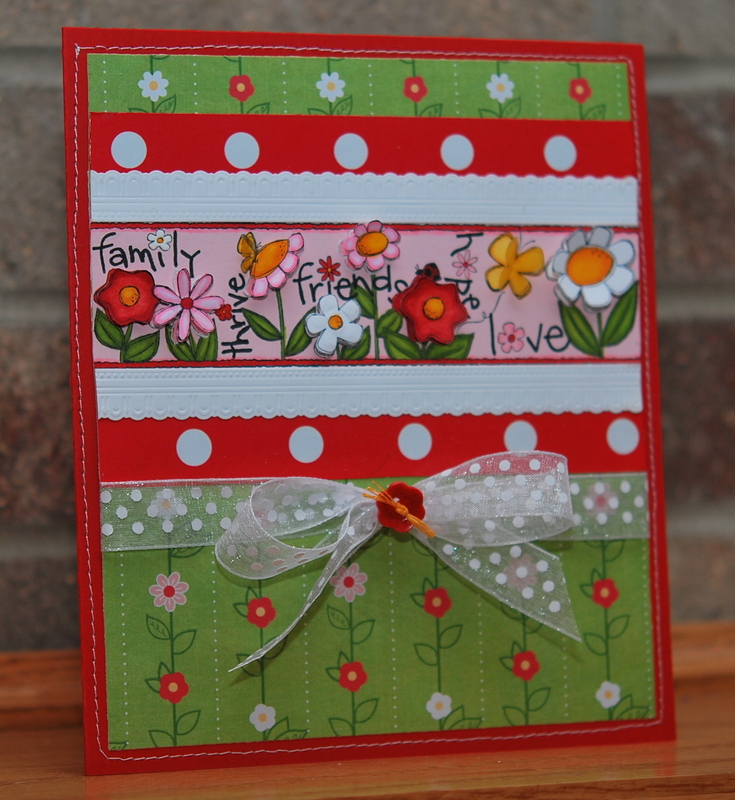 How’s this for a bright and cheery spring card? 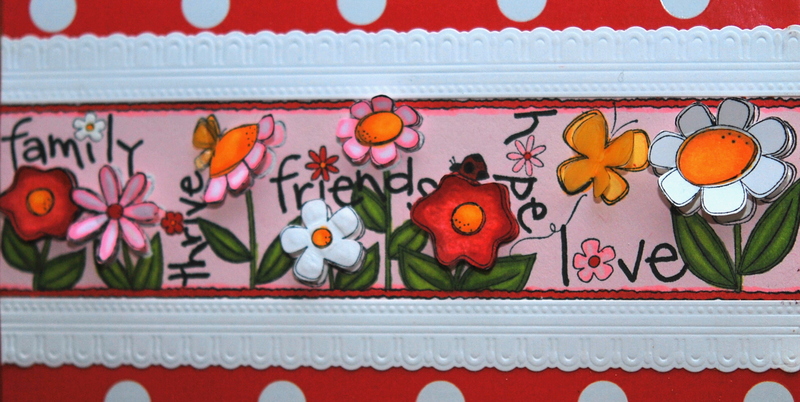 I just the love all these cute little flowers along with the words on this Stamps Happen stamp from Janlynn called Garden Flowers. I can’t tell you enough how awesome these stamps are to work with…they stamp out a very nice crisp impression every time. Please take a minute to see the huge selection of amazing stamps from Stamps Happen. You can check out the ENTIRE collection of Stamps Happen rubber stamps at Janlynn ~ they have an amazing selection of stamps and accessories! 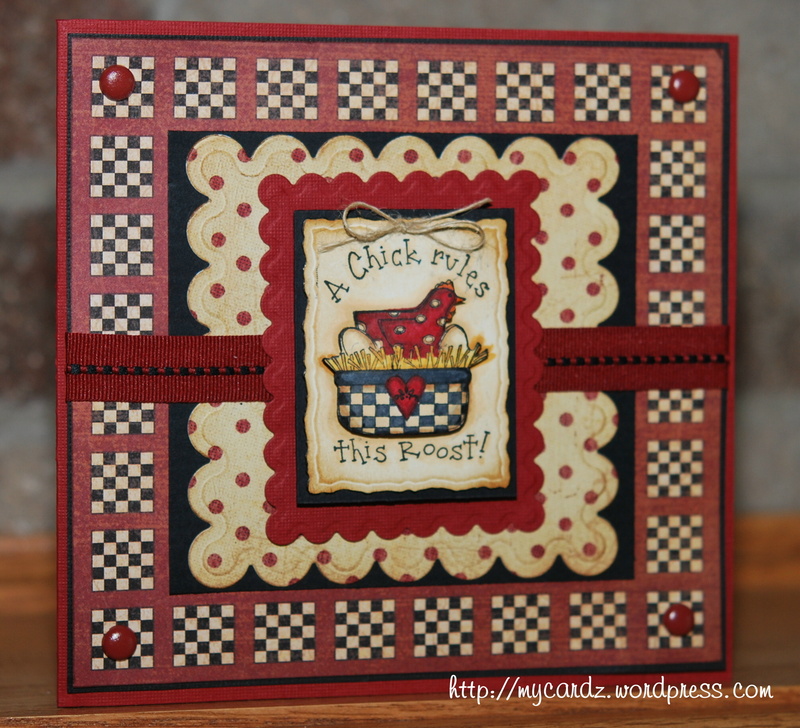 I hope you can take a peek at these stamps at Janlynn’s site, they have a HUGE selection…I know you’ll be impressed! Yay! I finally had an opportunity to color these guys. A few weeks ago I had mentioned that one of my favorite books to read (to my grand-kids) is Guess How Much I Love You, by Sam McBratney. My DD, Jessica (who was formerly known as Jessica G. before she was married, and swears she comments every day on my cardz!! I think the REAL Jessica G. had better set her straight!) 🙂 Anyway, my DD found this stamp from a company called Stamps Happen. It was a perfect match to the characters in the book. The sentiment, from PTI, is also from this book. You may wonder why I title this post “True Love“? I’m always amazed when I read stories about couples who have been together for sooo many years, through good times and bad, through sickness and health … and suddenly one of them passes away ~ shortly thereafter to find out that the other remaining partner soon “joins” the other. These stories amaze me. I think it refers to a true love that few really know. A very, very close person in my life lost his father in November; We have found out that his mother now has cancer and has been given a life expectancy of three months to two years. This card is for him. It’s so hard to find words to express how you feel at these times. 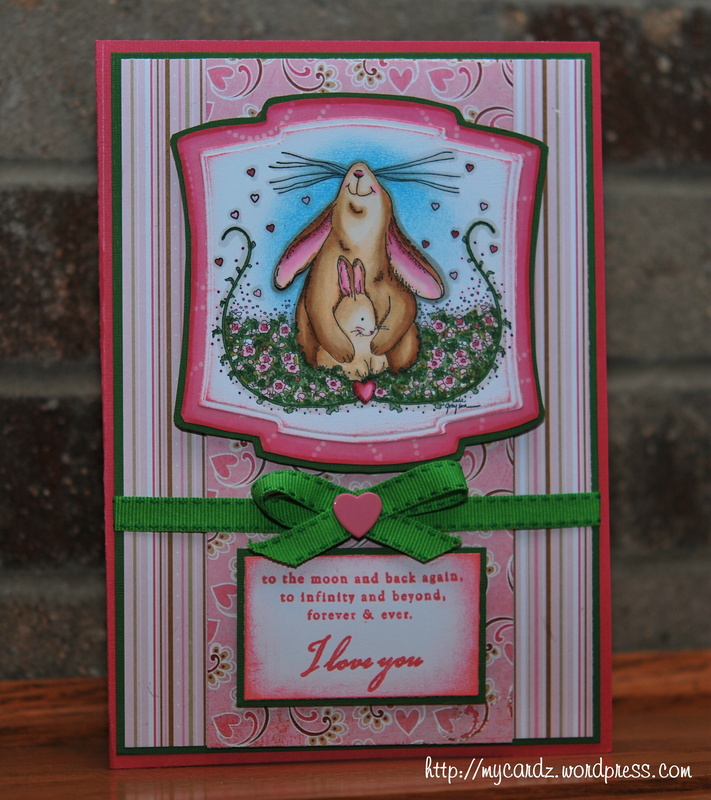 I really tried to keep the card as simple as possible as far as embellishments. I do, however, tend to use LOTS of marker colors when I’m feeling pretty intense about a particular subject. Well, this one is probably the highest number of colors I’ve used yet!! The stamp is from the company Stamps Happen, Inc., by D. Morgan, and named Through the Storm. Someone had previously left a comment to me that the stamps by this company are very detailed…I totally agree!! Thanks for listening to my long-windedness. My thoughts and prayers are with my friend, John, on the long road ahead. 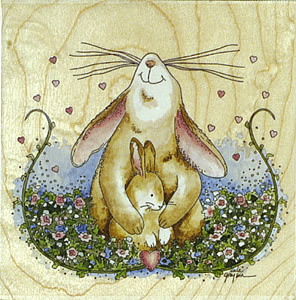 UPDATE: Yay, my Darling Daughter was able to find a stamp that looks VERY much like Big and Little Nutbrown Hare!!! The stamp is from a company called Stamps Happen. Yep, it’s ordered! 🙂 Here’s the stamp (how cute is that???) … I can’t wait till it comes! 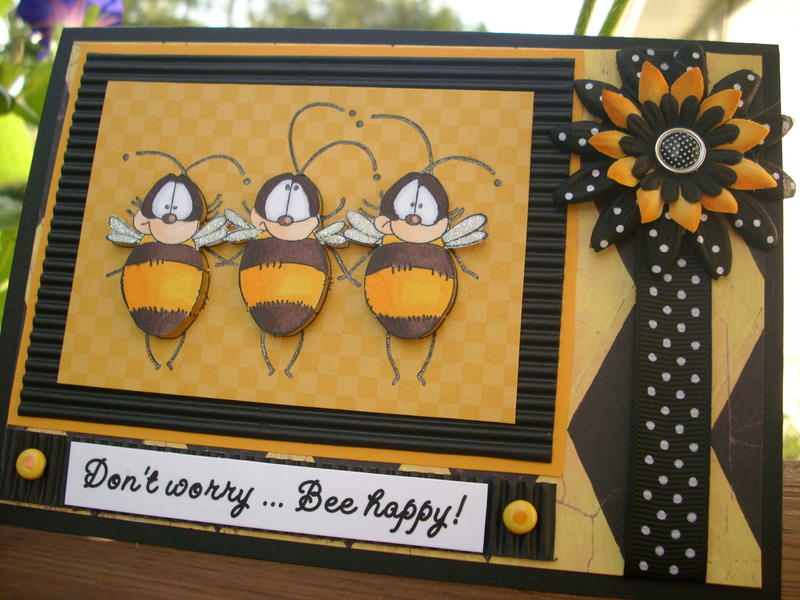 Don’t worry … Bee happy!